Of the 3 tops I recently got from SheIn (blush top here, white embroidered top here), I think this gingham one is my favorite. It fits the best and I like the longer length. I ordered a size medium because I typically size up in SheIn items and there is plenty of room. The peplum style and bow tie back makes it even better! When you find pretty tops like this you need to grab them quickly! They look good with pants, shorts, or skirts and go with any color you pair with them. And for only $20, it's pretty budget friendly which I love. Are you loving gingham this spring? 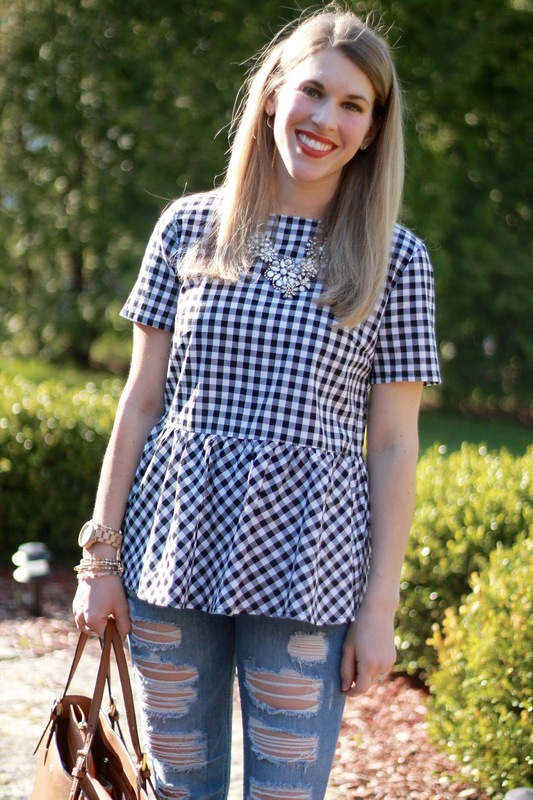 I love gingham and this top is so adorable on you! Such a great piece from SheIN and you're right, so budget friendly. It will be adorable with shorts! this top is so adorable. I love gingham so much! This top is super adorable on you with the cute bow back detail, Laura! I am linking up a new gingham dress today, too! This peplum top is just the cutest, loving the back details! 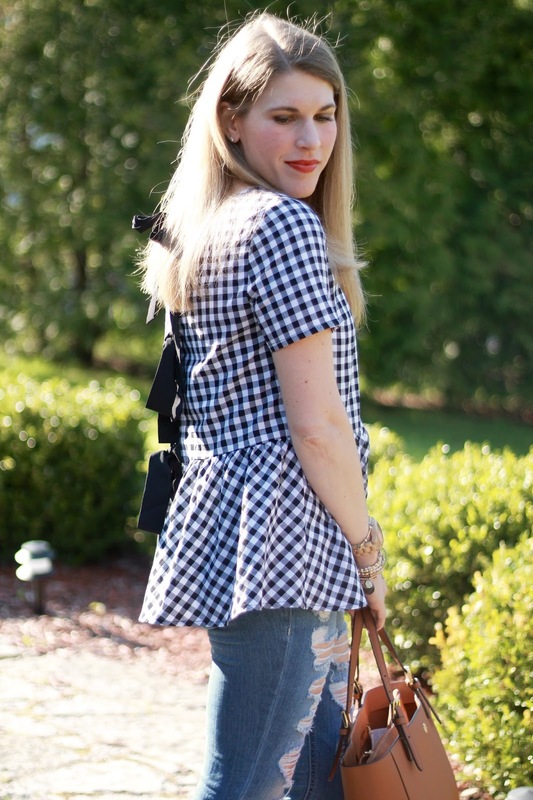 I love the peplum and gingham together in this top! Such a cute look Laura! 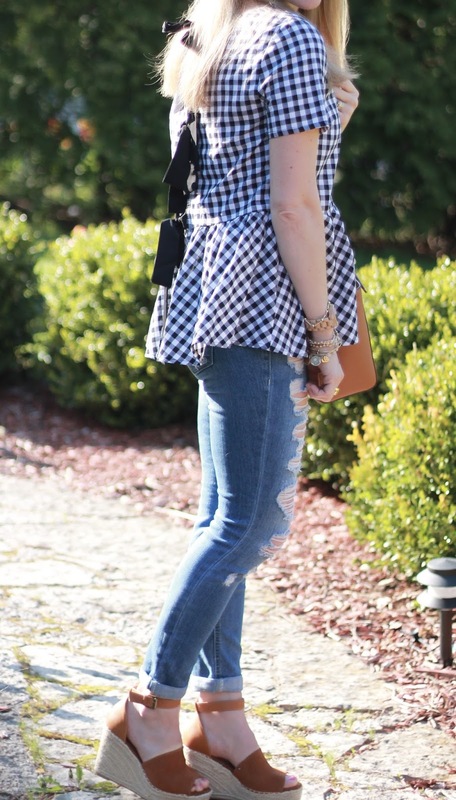 I love gingham and the I love peplum, too, so this is an adorable combo. Too cute! 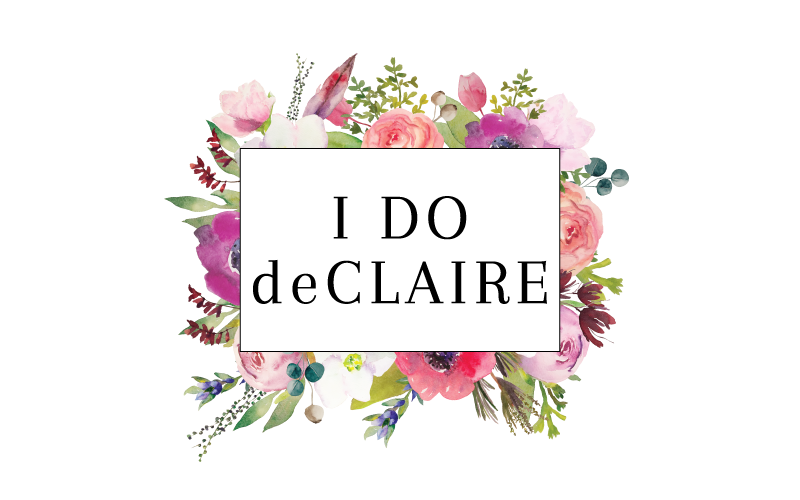 You have had so many great Shein finds! That top is the cutest! Love the peplum and bow tie back! That is such a cute peplum top! The bow detail in the back is just adorable, and what a great price too! :) Peplum will come in handy over the next couple of months too for you hehe! Love the bow detail of your pretty gingham top! Looks great paired with those fabulous jeans! I really like gingham yet I still don't have any in my closet! But the bows on the back of this really set this one apart!! How cute! This gingham is SO cute on you, lady! I have this same top and love it. Looks great on you! What a cute top! Perfect for Spring and perfect styling! This gingham print always reminds me of summer BBQ's :) It makes me so happy! And its adorable on you too. Oh wow! That top is adorable. I have shoes like yours ordered but they are on back order! Seeing you style them makes me wish mine would hurry up and get here! Great post! Love, love, love everything about this look! your top is so pretty, love the bow back detail! One of my favorite tops too. You look great in it! Such a fun top! I love the back! I just love that top! This top is so cute! Loving the bows on back. Peplum is one look I adore but cannot wear unless it hits me just right. Looks precious on you. I am all about gingham right now. This top is so gorgeous on you! I've had my eye on those cool tops with the bows in the back, this is such a pretty one Laura ! I've yet to take the plunge. Such a pretty top! You look adorable! sucha cute look laura!!! love the gingham! This is such a darling top Laura, I am tempted! Love it with the skinny jeans and those pretty sandals. Details really make certain tops and i love this. Beautiful top, Laura! I love gingham because it never goes out of fashion. I recently just got a gingham top and I am loving the trend. This one looks great on you and detail on the back is so fun. Those jeans are great too! I've definitely been loving gingham lately! I'm happy it seems to be a pattern that comes back every spring. This is such a cute gingham top! I actually ordered it a couple of weeks ago, and hope it looks as cute on me as it does you! That Gingham with back lace is so adorable. Love it. You are awesome at finding the best SheIn tops! I have been loving everything lately. This one is adorable and it'd be perfect for one of my upcoming trips- so I'm going to pin it! I also LOVE those jeans! I'm all about gingham lately and always on the hunt to find some unique pieces in this print! Loving your top! This peplum is perfect! I love it paired with the distressed jeans to give it a "cool" look! 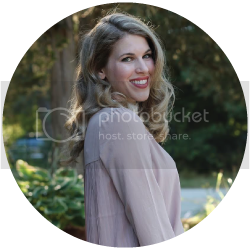 Laura, you've got another great find from Shein! I have seen this top plenty of times and have found myself wanting this too. 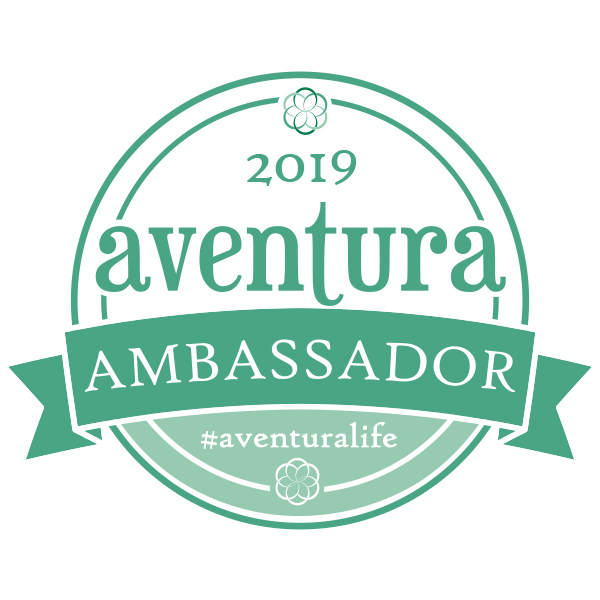 It looks amazing on you! What an adorable gingham top! Love! The bows are so cute! That top really is adorable, and it's hard to beat the price! Gingham just feels like the fabric to wear to officially 'declaire' nice weather is upon us! Such a pretty top!! I love it! Great modern take on gingham! It looks fantastic with your distressed jeans. I love gingham for spring and summer. Love the style of this one, and the bows in back are so pretty. You look lovely! All of my favorite bloggers are wearing the cutest tops right now! I guess I need to check out Shein because it seems they have the best selection! 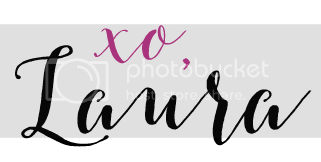 I'm linking up today Laura, my first time! But not my last. Ha! I didn't even notice that in pictures! I think it's just the way I am standing. I have worn it a few times and haven't noticed anything. Typically I would say the quality is equivalent to something from Old Navy, Target, or Walmart. Not exceptional, but since the price is so low, that's ok with me. Typically I am looking for a cheap trendy item and SheIn definitely fills that need for me! I adore how you styled this Laura! I just received that same top in the mail last week but in the red check and still trying to Figure out what to put with it. You look adorable! I love the top, especially the color and pattern. Ahh SO cute! I don't have any gingham tops yet, but I will definitely consider this one! Love the top and the whole outfit! LOVE the top, it's adorable!